Ultimately the choice comes down to the individual, but here are some points about each. An acoustic guitar is a beautiful instrument that is light, portable, versatile and has a rich history of exciting musical culture and kudos attached to it. Most beginners start off playing on an acoustic guitar but it is not essential for any student to do so and I totally recommend that students who really wish to begin playing on an electric guitar do so. However, the simplicity and ease of using an acoustic guitar, coupled with it’s lighter weight, makes it a popular choice for students and parents who will be carrying the guitar into school each week! For primary school children 1/2 size or 3/4 size nylon strung guitars are the most popular choice although many students use steel strung guitars too. For infant school children the nylon strung guitar is a good choice as it is physically less strenuous on their little fingers. Nylon strung guitars have a more mellow sound and are often referred to as ‘classical guitars’. Steel strung guitars sound brighter and are a little more strenuous to play in the early stages of learning. Electric guitars… What can I say? “They’re very good” would be an understatement! The electric guitar played a huge part in the cultural shift that gave birth to rock’n’roll and the concept of the modern band and pop culture as we know it. The electric guitar is exciting even without an awareness of that context, and clearly, even young children recognise its appeal, and outlandish character! 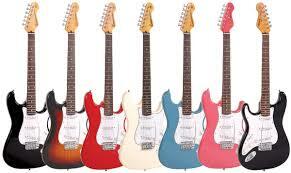 There are many cheap yet good electric guitars on sale and they are not usually as expensive as people imagine. If considering an electric guitar for use in school, remember that they ideally need to be played through an amplifier, otherwise they become cool looking, very quiet instruments. There are very small, battery operated amps (not much bigger than a canned drink) readily available too which can be carried into school with ease, and the guitar lead to connect them will fit easily into the guitar case or gig bag – See the Marshall MS2R below. 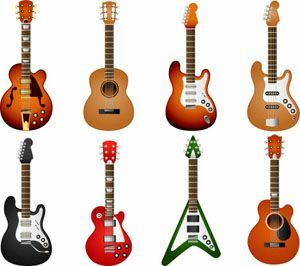 Electric guitars are heavier than acoustic guitars as they are usually made of solid wood, but they are not so heavy as to be unpractical for schools and like acoustic guitars, they are made in various sizes like 1/2, 3/4 and even 7/8 size. A padded case is a good idea though! 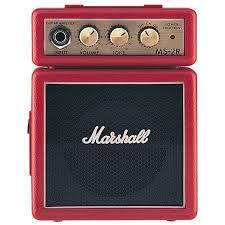 The ‘Marshall MS2R’ micro amp Perfect for taking into schools. I have one of these and I love it! The tones available are limited but good and useable. 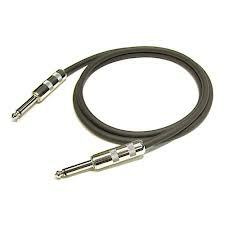 Guitar Lead or Cable Don’t forget you’ll need one of these to connect the guitar to the amp! They can be bought for just a few pounds. 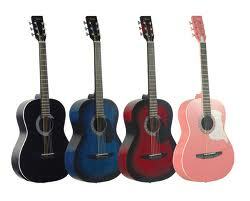 Both acoustic and electric guitars come in many different styles, colours, sizes and price ranges. If you’re somebody who fancies playing guitar but have not really thought which type you’d prefer, then an acoustic guitar is a nice easy option and is a rewarding instrument to play. The consideration of nylon or steel strings is also a personal choice and neither is ‘better’ than the other. Beginners often use nylon strung guitars for ease on their fingers, although you can pay thousands of pounds for these types too so they are not a beginners instrument alone. Steel strung guitars are more common throughout popular music, and most bands use these if playing acoustic guitars. Electric guitars are the most versatile type of guitar with many variations to the shapes, colours, electronics and overall sound produced. This is then taken to further realms of tone bending mayhem with the amount of amplifiers available, all adding their unique tone and voicing to the sound of any given guitar going through it. Electric guitars can play ‘clean’ sounds which are more pure and less effected, whereas the same guitar, through a suitable amplifier can sound ‘dirty’ or distorted, which is more like the typical rock sound. On top of that, electric guitars can go through effects units before getting to the amp, which will then add even more tonal madness to the situation! Image | This entry was posted in Private Tuition, Schools & Education and tagged acoustic guitar, acoustic or electric guitar?, electric guitar, free guitar lessons, Guitar lesson, guitar lessons hazel grove, guitar lessons stockport, Guitar Teacher Hazel Grove, guitar teacher stockport, Kevin Burke, Kevin Burke Guitar, which guitar?, www.kevinburkeguitar.com. Bookmark the permalink.